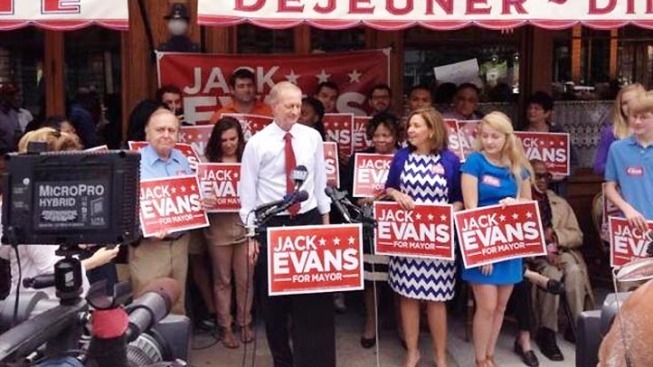 Ward 2 Councilmember Jack Evans (white shirt) announcing his mayoral candidacy. D.C. Councilmember Jack Evans still has raised the most money of the candidates for mayor of Washington, and Councilmember Muriel Bowser still has the most left to spend. Both have a big lead on Mayor Vincent Gray, who just announced this month that he's seeking re-election and hasn't raised a penny so far. The Democratic primary is April 1. The candidates filed financial reports late Tuesday. Evans is the first candidate to top $1 million and has $582,000 left to spend. Bowser has raised $920,000 and has $756,000 in the bank. Restaurateur Andy Shallal, who entered the race a month ago, has raised $120,000, including $45,000 that he lent to his campaign. That's the third-highest total over the past two months, ahead of councilmembers Tommy Wells and Vincent Orange.